The residents of Bageshwar are living in fear of the leopard. 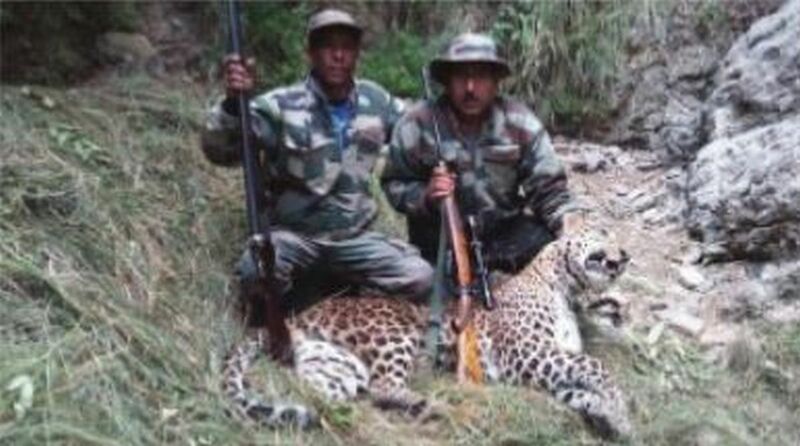 A file photo of Lakhapat Singh Rawat (right) after shooting a man-eater leopard in Bageshwar on 12 October. The Uttarakhand forest department has started a fresh operation to end the terror of a man-eating leopard in Bageshwar. Recently a 15-year-old boy lost his life after falling down a gorge when he was fleeing from the leopard. Three cages have been placed in different parts of the city and staff with tranquiliser guns deployed to trap the man-eater at Dhiyaghar and other places. In a new development, specialised man-eater shooter Lakhapat Rawat, whose gun was deposited at Gairsain police station due to local body election in Uttarakhand, was provided special permission to take it back. On the forest department’s request, the local administration released the firearm of Rawat, who will be heading for the leopard-affected town on Tuesday for the special operation. The residents of Bageshwar are living in fear of the leopard. Last month a leopard was gunned down by Rawat. In the same area a leopard was trapped in September in a cage installed by the forest department. But, even after getting rid of two leopards fear and an undeclared curfew prevail in Bageshwar. Many CCTV videos, obtained from hotels and other places, show the leopards moving freely in the small and compact Bageshwar market. The recent incident, in which the boy fell down the gorge, prompted the local residents to launch an agitation against the forest department. They blocked the national highway on 10 November to force the forest department to declare the dangerous leopard a man-eater and issue warrant to kill the feline. Bageshwar’s divisional forest officer RK Singh said, “We are tracking the movement of the leopard and for this we have fixed camera traps. Three cages have been placed in different locations.” The presence of so many leopards, two more as CCTV data indicates, has surprised all. Bageshwar is a small place and the affected area is near the main area of the city, where a bus station, local court, Baghnath temple, main market, etc., are located.